Big Money Starts With Small MoneyEliminate The Muda! Who provided you guidance in the ways of money management? Did your parents set a good example and teach you how to save and invest? Was there a mentor in your life that provided you insight on financial planning? Too many start too late in life to achieve their greatest potential. We waste our youth living “life” while our future opportunities are buried by the wastefulness of today’s energy and ignorance. I claim to be no better equipped than most. I too have cut in half my future wealth due to ignorance and inexperience. However, all is not lost and even with the mistakes of the past you can be confident that you and anyone else with Persistent Purpose may achieve financial comfort. Following the Financial Principles I have learned over the past decade have forever changed my financial future for the better, and they can change your future as well. Survive and thrive without being a drain on society. Be self-reliant and self-supportive. Be able to not only give to yourself the future you deserve, be able to give to others. The greatest joy however will be the gift you may give to your children. The magic of growing wealth due in large part to the power of compounding interest. With an array of options that include simple savings accounts, to IRAs, mutual funds, real estate and equities the choices to invest are nearly endless. With consistent investment of your savings in sound vehicles, in time you will be rewarded with Big Money. But all Big Money starts with Small Money. You may have started your road to wealth late in life and this has limited your lifetime potential. Does it pain you to consider what could have been? What if you started when you were small? Imagine if you had been provided the right guidance when you were young. Imagine what your children could accomplish with a lifetime of knowledge and guidance with the methods of sound financial management. Big money starts with small money. 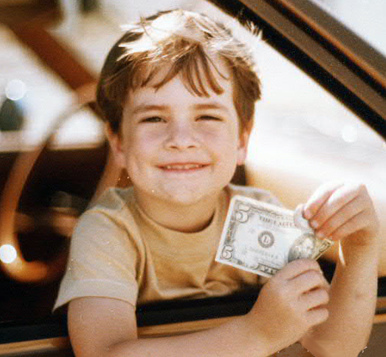 Set the kids on a path of financial freedom, help their small money become big money.